Can’t make it to the site, but want to support others who can? That’s great: there are lots of options for you. If you’d like to support online with petitions and social media, click here. 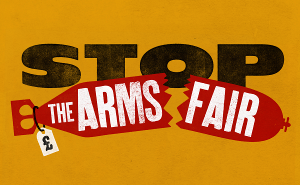 If you’d like to donate money to support Stop the Arms Fair, click here. If you live in London and would like to offer crash space for activists coming in from other parts of the country and the world, click here.